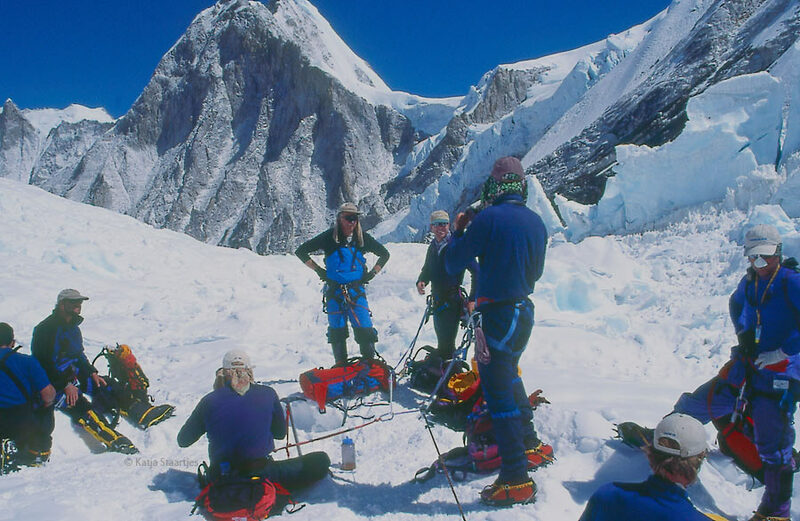 After the success on Cho Oyu and the breathtaking view of Mount Everest from the 8,201 m high peak, Katja started thinking about climbing ‘the number 1’. 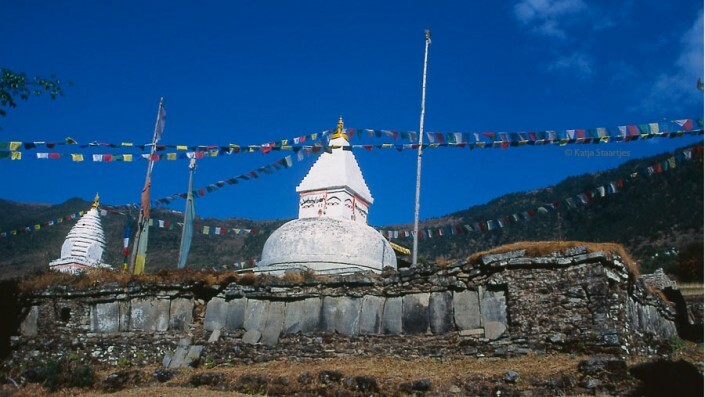 The mother-goddess of the world (Chomolungma), as the Sherpa’s and Tibetans call the mountain, was an incredibly attractive prospect. 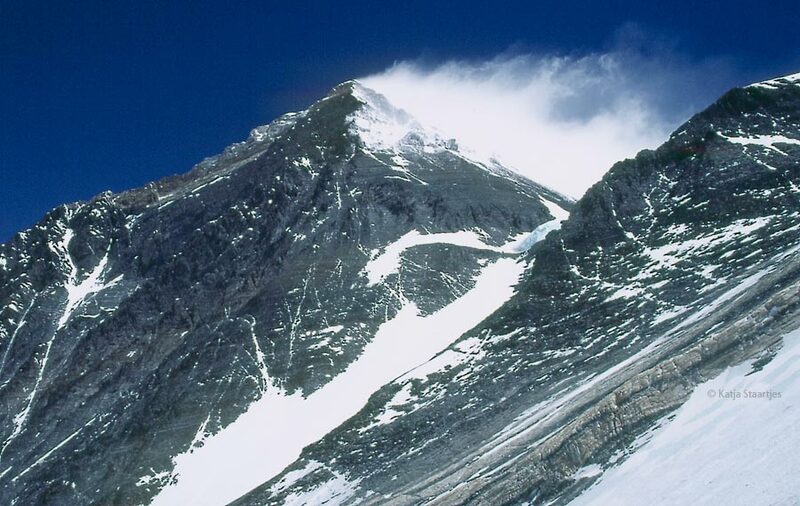 Although there are considerably more difficult mountains to climb, none are higher than the Mount Everest peak at 8,848 metres. 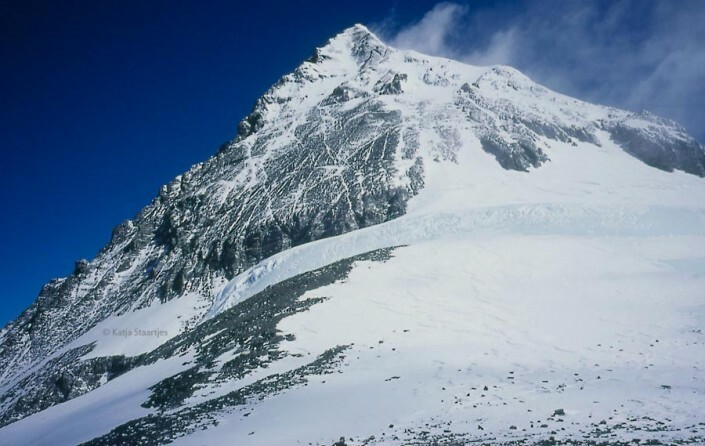 And that makes it unique. 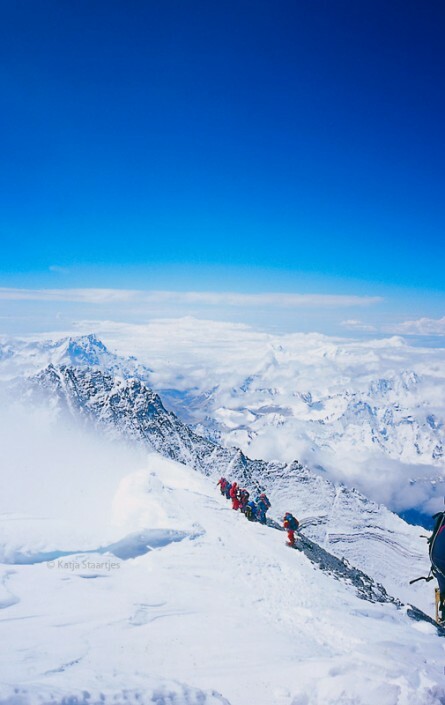 Consequently, like Mont Blanc, it tends to get very busy on this mountain – not something that the Dutch mountaineer finds enchanting. 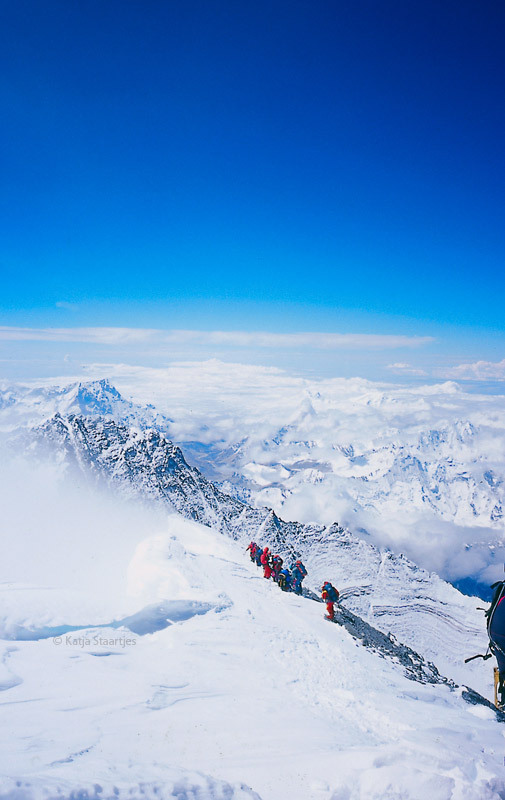 Katja: “Participating in a guided commercial expedition to Everest would be the chance to get to the highest peak in the world. 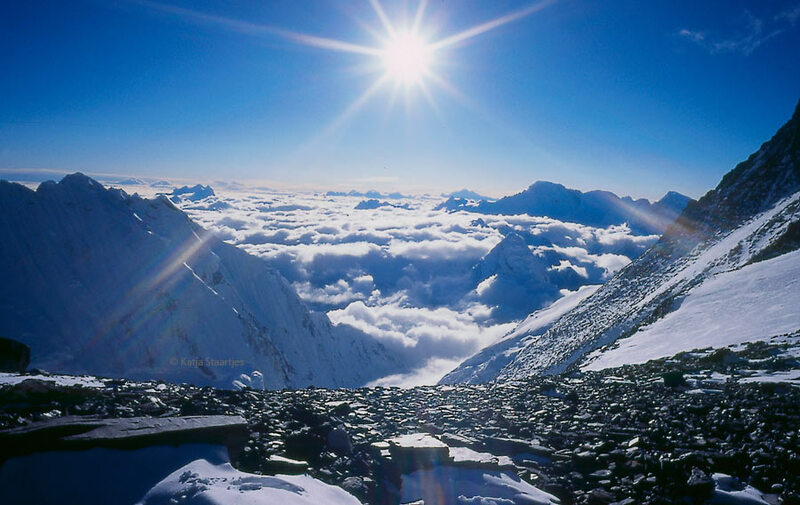 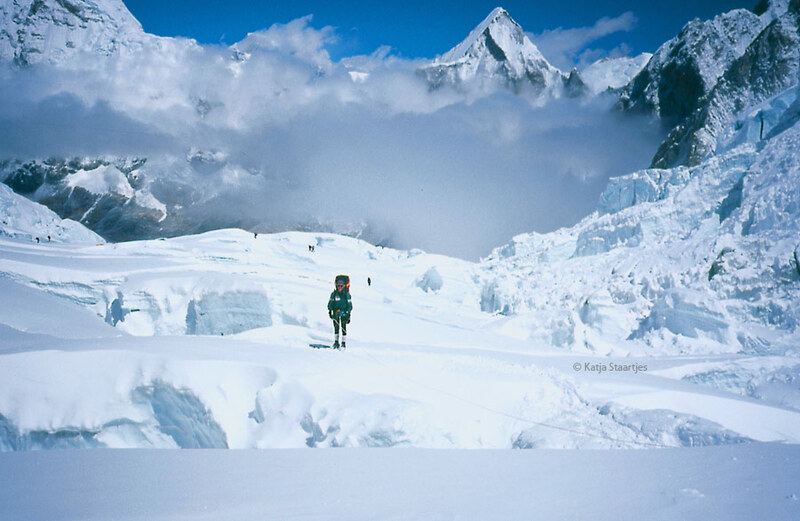 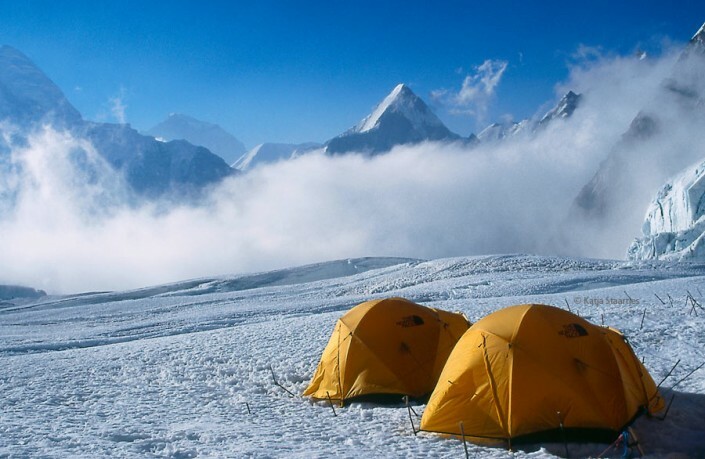 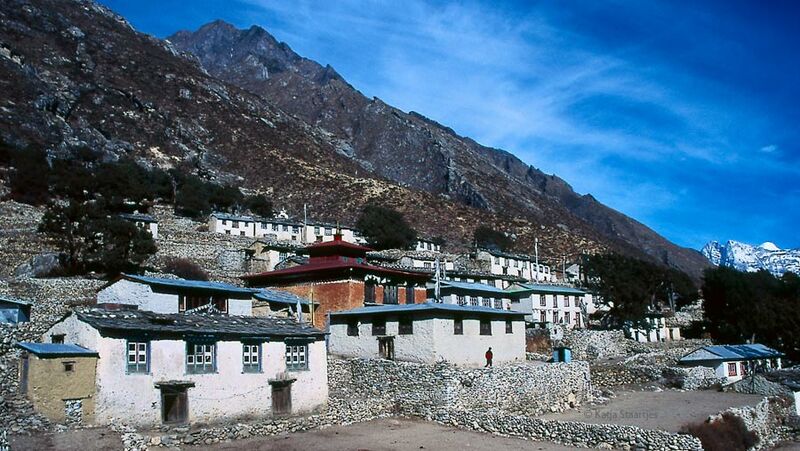 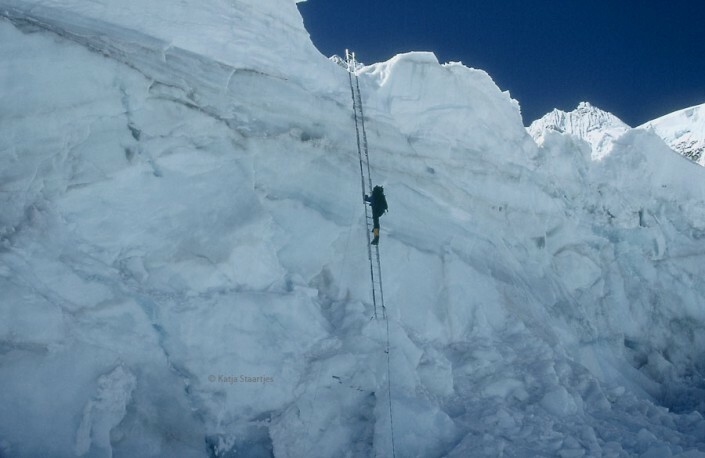 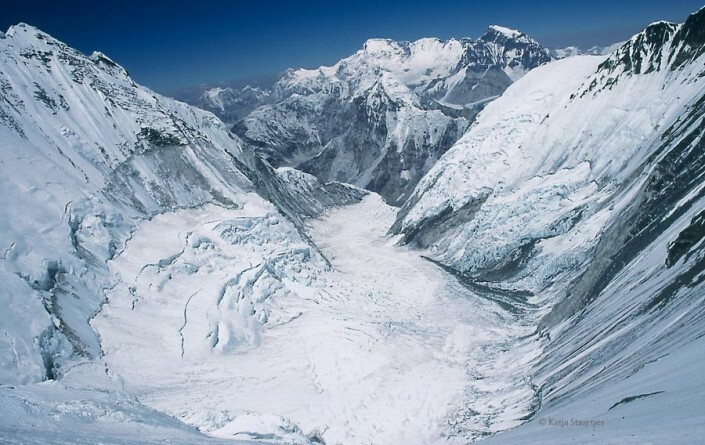 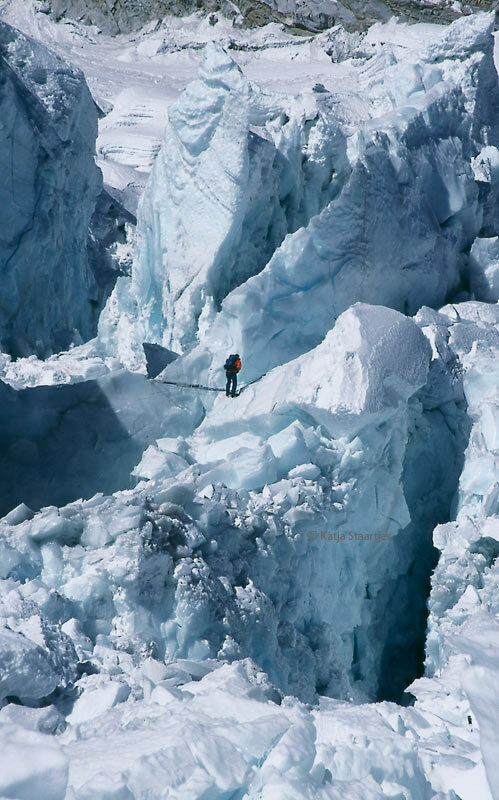 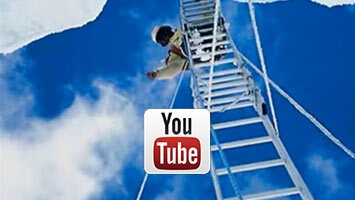 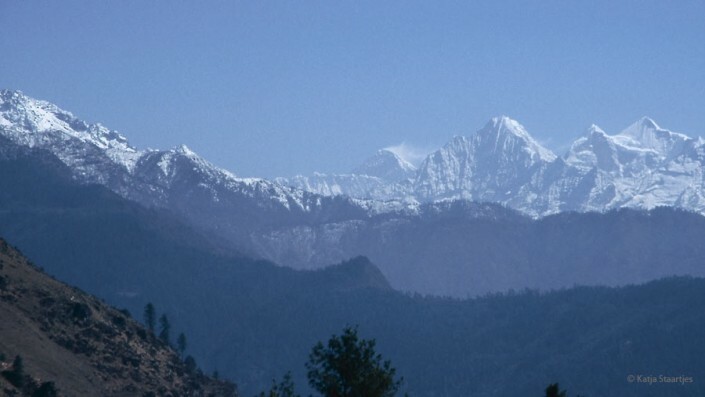 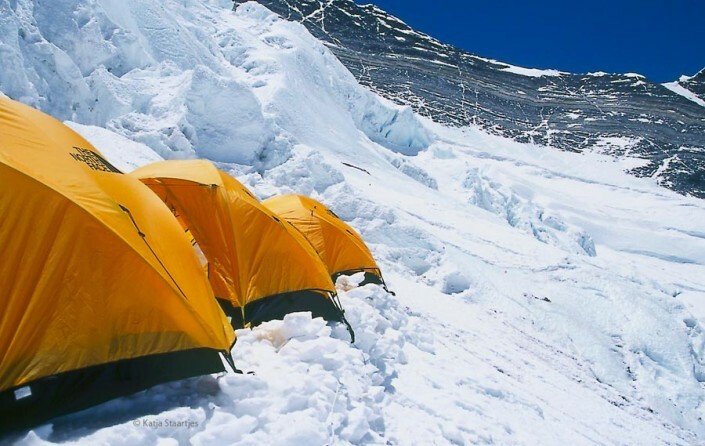 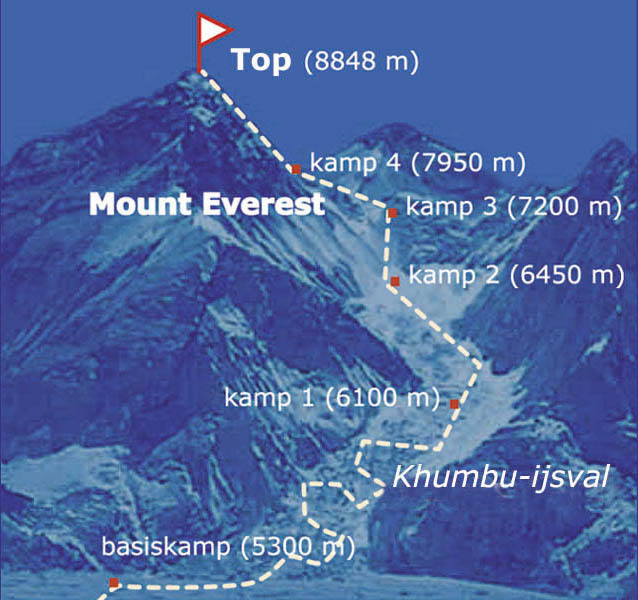 To see for myself all those famous places, such as the Khumbu ice-fall and the Hillary Step. 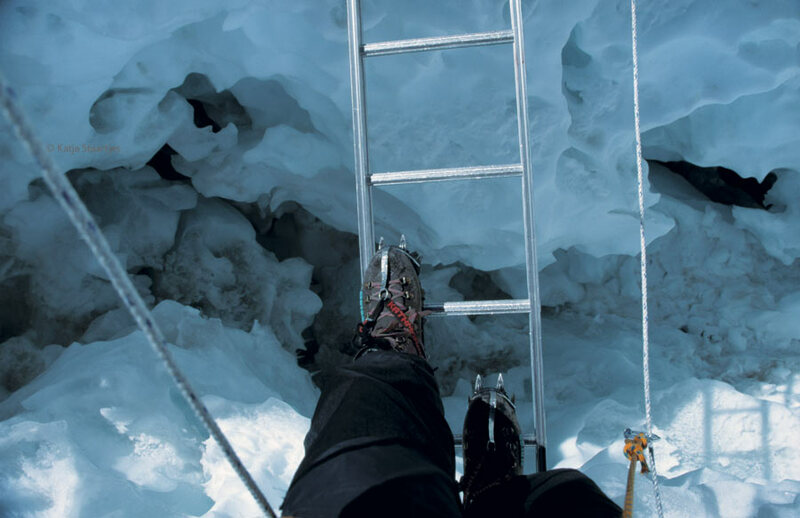 It also offered the potential for gaining more experience. 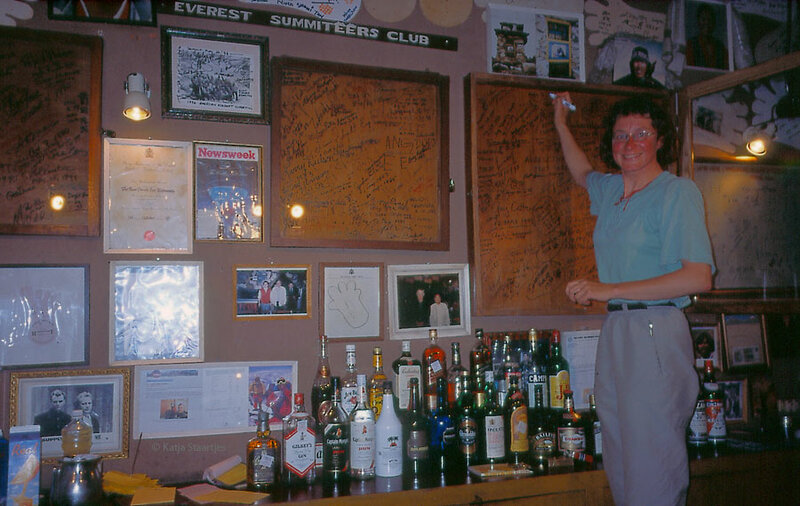 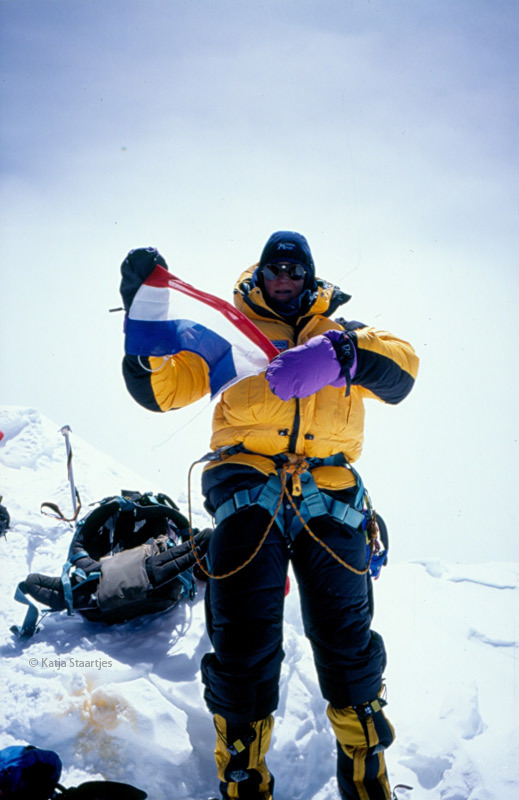 None of the Dutch mountaineers had any plans involving Everest. So participating in an organised international Everest expedition was therefore the only option. I chose to join the expedition of Out There Trekking (OTT, from Britain). 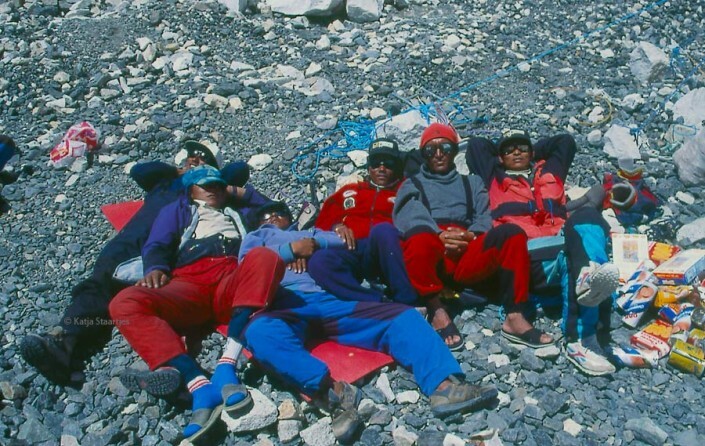 We formed a big group of nine nationalities, supported by a Nepalese Sherpa team. 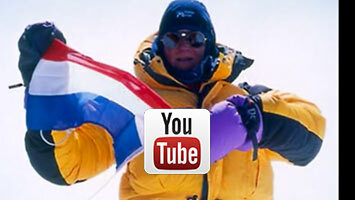 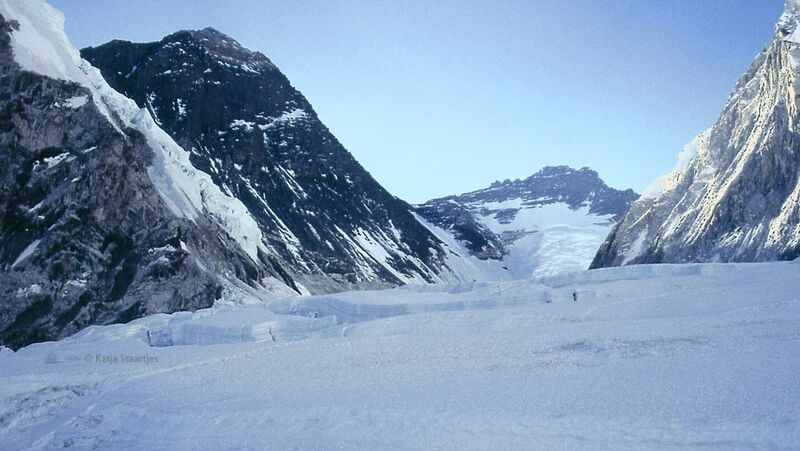 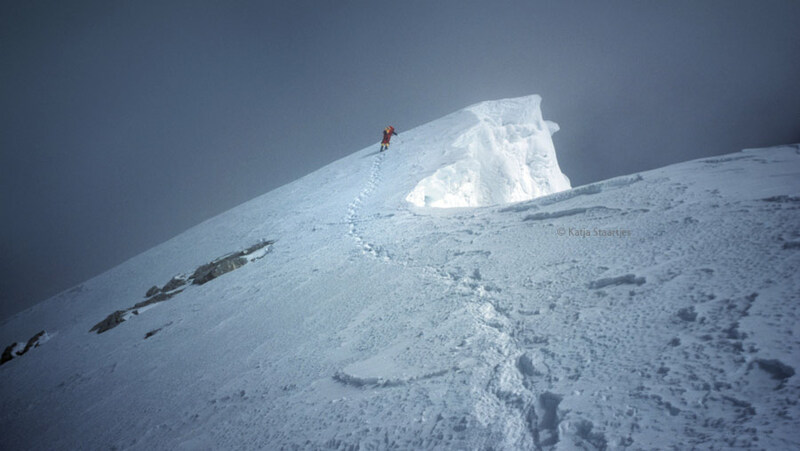 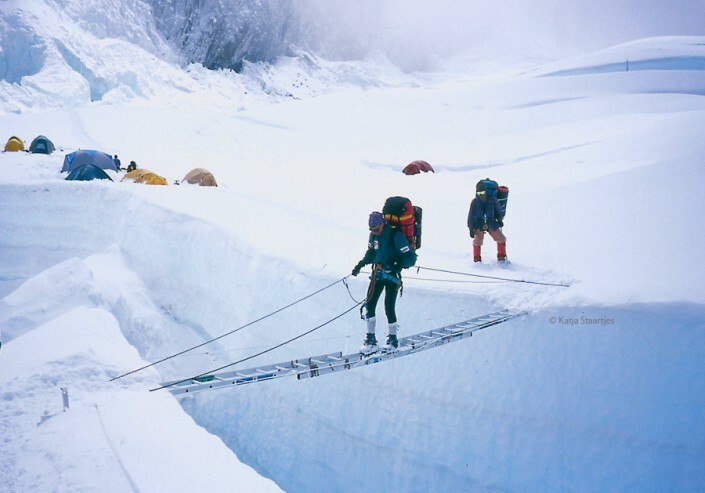 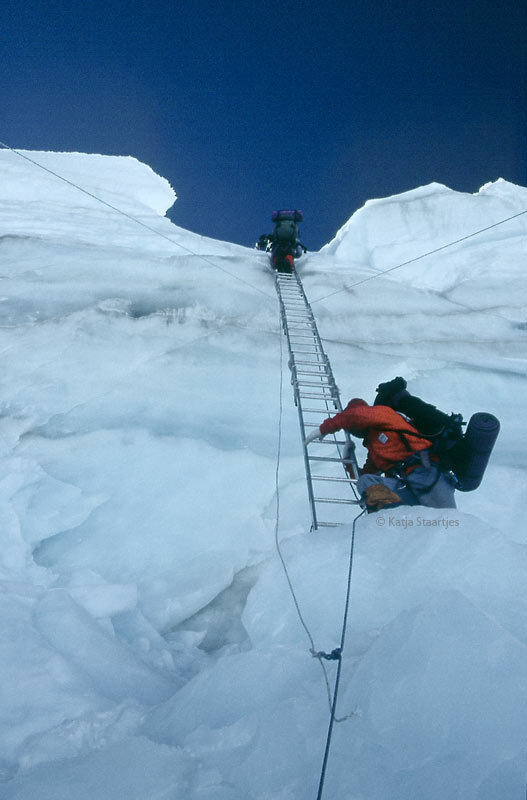 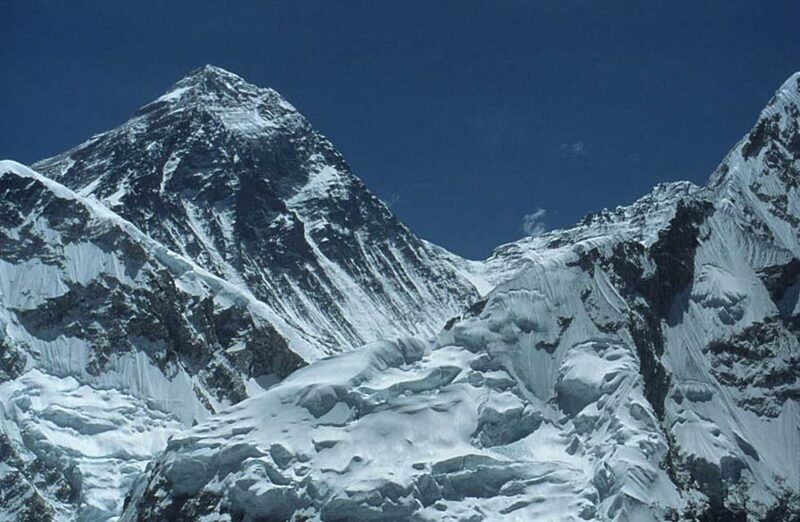 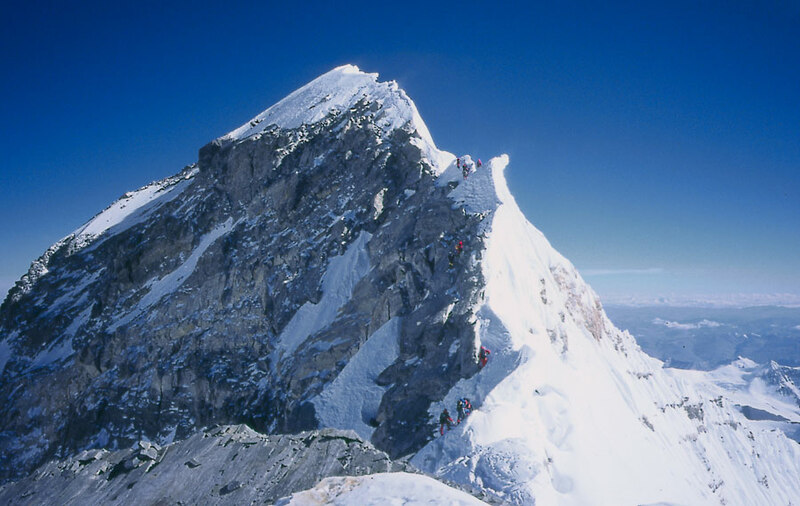 Ultimately thirteen of the twenty six climbers reached the summit; first Willy Benegas (12 may 1999), and the other twelve climbers on 13th may. 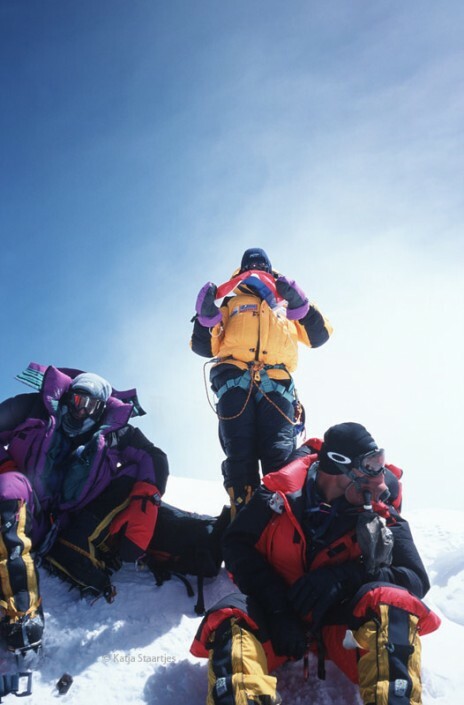 This achievement was completely rescinded by the death of one of the team members, the Brit Michael Matthews. 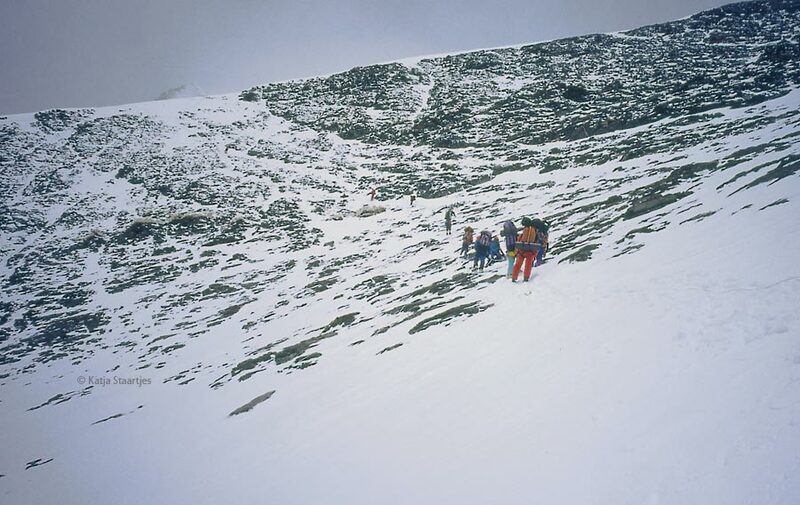 In the descent from the peak, in particularly bad weather, Michael went missing. 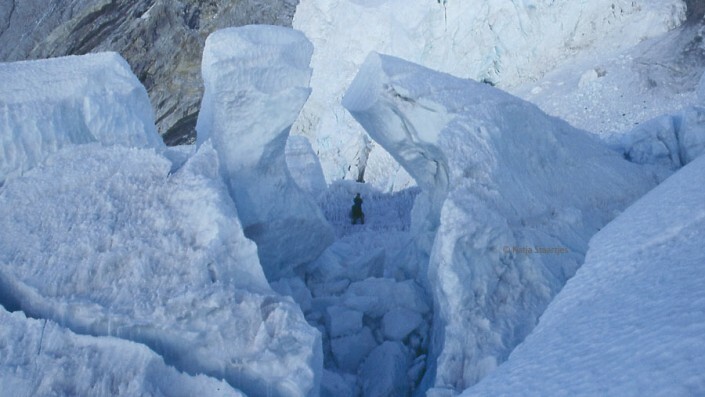 A devastating ending. 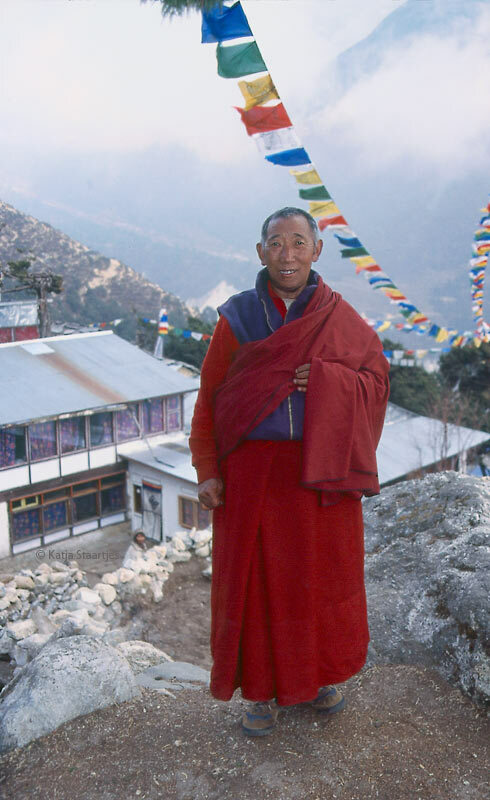 His body has not been recovered to date, so we still do not know what happened to him. 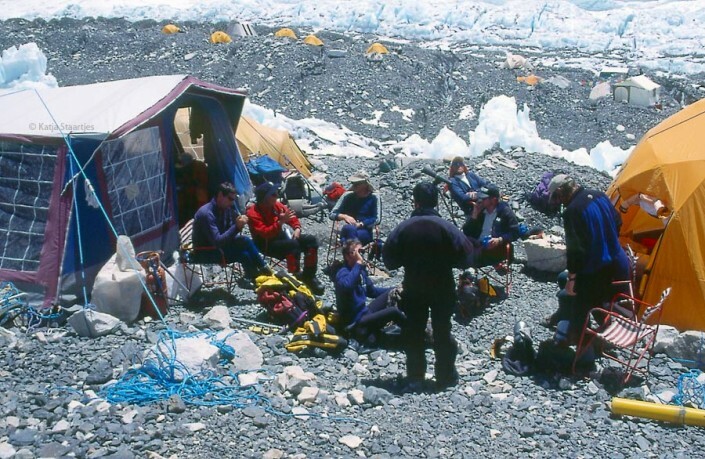 The expedition was a profound experience in many ways, not only by the bad ending. 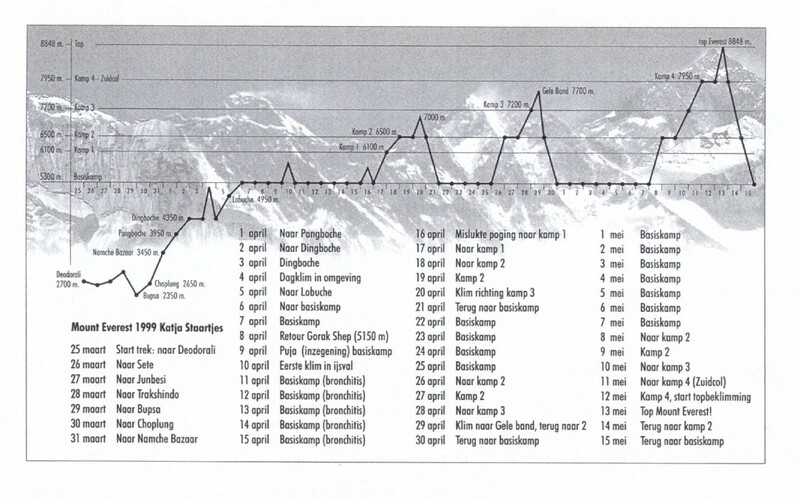 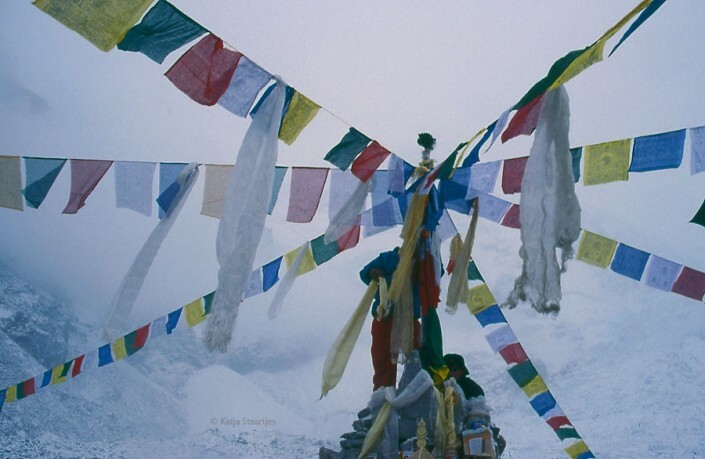 A deeply personal report of the Everest climb can be read in my (Dutch) book Hoog spel.